Public Health Law and Ethics: A Reader, 3rd Edition probes the legal and ethical issues at the heart of public health through an incisive selection of judicial opinions, scholarly articles, and government reports. 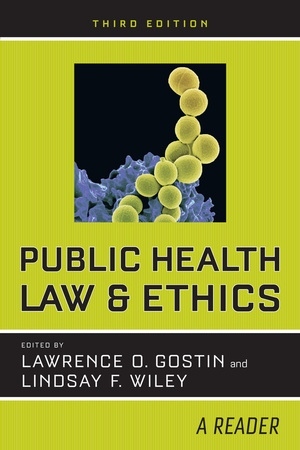 Crafted to be accessible to students while thorough enough for use by practitioners, policy makers, scholars, and teachers alike, the reader can be used as a stand-alone resource or alongside the internationally acclaimed Public Health Law: Power, Duty, Restraint, 3rd Edition. This updated edition reader includes new discussions of today’s most pressing health threats, such as chronic diseases, emerging infectious diseases, antimicrobial resistance, biosecurity, opioid overdose, gun violence, and health disparities. Lawrence O. Gostin is University Professor and Founding Linda D. and Timothy J. O’Neill Professor of Global Health Law at Georgetown University, where he directs the O'Neill Institute for National and Global Health Law. He is also the director of the World Health Organization Collaborating Center on National and Global Health Law and Professor of Public Health at Johns Hopkins University. Lindsay F. Wiley is Professor of Law at American University’s Washington College of Law where she directs the Health Law and Policy Program. She is President of the American Society for Law, Medicine, and Ethics and a former member of the National Conference of Lawyers and Scientists.